This article is about how awesome Katamari Damacy is. But first, this. As everyone knows, Super Smash Bros. Ultimate launches this Friday, 12/7. It’s one of the biggest releases of the year on any platform, but for Switch owners in particular, there are few games bigger than Smash. This is with good reason. The Smash Bros. series is generally regarded as pretty fantastic, if just for the fan service alone. There aren’t many officially licensed opportunities to see Mario punch Pikachu in the face while Samus blasts Simon Belmont with a super missile and Cloud from Final Fantasy VII gets eaten by Kirby. It’s huge. It’s huger than huge. And that’s hardly a secret. When giant blockbuster movies come out, other movies tend to steer clear of that date, especially if they’re targeting a similar audience. Warner Bros changed the release date for Batman V Superman because Captain America: Civil War was releasing on the same day. These things happen. People only have so much money and time. Of course, if your product does not intersect with the guaranteed blockbuster’s audience, that’s a different story. If a courtroom drama was releasing the same day as Captain America: Civil War, the audience doesn’t overlap, so why not release on the same day? We’re all on the same page now, right? Now, let’s change gears a bit and talk about one of the most wonderful games I’ve ever played in my life, Katamari Damacy. Originally released on the PlayStation 2 in September 2004, Katamari was one of those singular gaming experiences that nailed nearly every piece of what it was trying to do. It wasn’t the prettiest game ever made, the controls took a minute to get used to, and it was WEIRD. Like, really weird. But it succeeded in a way that the best arcade games of yore did. Its concept was quickly apparent, its world was immediately inviting, and the moment you picked up the controller you were having fun. Over the years I’ve put this game in the hands of so many different people, and each and every one of them found the fun in it. Gamers, parents, children, everyone. Like Pac-Man or Space Invaders, Katamari just makes sense (even though it actually makes no sense at all) and it’s simply one of the most perfect gaming experiences I’ve ever had in my life. And it’s being remastered for the Nintendo Switch as Katamari Damacy REROLL. Yes, you should be excited about that. Again, Katamari isn’t a perfect game. Far from it. But it succeeds in being charming and fun enough to transcend its faults, and it’s without a doubt one of my very favorite games of all-time. If you’ve never been introduced to the wonderful world of Katamari Damacy, the premise is simple. You control a character who rolls a ball around. Everything, and I do mean EVERYTHING, sticks to this ball as long as it’s smaller than the ball itself. The more stuff you get to stick to your ball, the bigger it gets. The bigger it gets, the bigger the things you can get to stick to it. In some levels you will start very small, only a few centimeters tall. You’ll roll up some thumb tacks and paperclips until you’re big enough to pick up a pencil eraser, then some pencils, then some batteries, then some fruit, then some mice, then the basket that held the fruit, then a cat, then a dog, then a person, then a car, and so on and so on until you’re big enough to pick up the roads themselves, entire buildings, islands, and even the clouds in the sky. The concept seems insane because it is, and the world the game takes place in reflects that. Yes, there is actually a story behind this crazy ball rolling game, and it’s so bananas it’s hard not to completely fall in love with. The character you play as is The Prince. He’s an adorable little green guy who seems very happy to be wherever he is. However, the character you’ll remember the most is your father, the King of All Cosmos. This extremely flamboyant, and occasionally verbally abusive giant is the reason this game is taking place at all. See, one night he got drunk and accidentally destroyed all the stars in the sky. So he has summoned you, The Prince, to fix his mistake. He bestows upon you the Katamari, a magical ball that everything sticks to. You are sent to Earth to roll things up with the Katamari in a set amount of time (because he can only be bothered to stay interested in what you’re doing for a few minutes at a time), at which point you give the Katamari back to your father, he evaluates it, and sends it into space where it turns into a new star. Before and after every stage in the game there are these brilliant little segments where the King stands above you in all his splendor and either berates you for not making your Katamari big enough, or spouting other random bits of whatever fever dream he’s experiencing at the time. Did I mention the King of All Cosmos is completely insane? Because he is. For me though, the very best thing about Katamari is its music. Don’t get me wrong, I’m head over heels in love with just about every aspect of Katamari, but the music is truly special. It’s every bit as strange as the game it’s attached to, but unlike the game itself, the music has a surprising amount of depth to it. Katamari Damacy is good fun through and through, with a tremendous sense of humor to boot, but the music can be goofy one minute, and sincerely beautiful the next. No aspect of the story in Katamari is going to bring the feels if you know what I mean, but some of these tunes just sneak up on you. Take the “map” music, a song called The Wonderful Star’s Walk is Wonderful. It starts off as this delightful little acoustic guitar riff with some strange chiptune-ish sound effects going on over it. Now, this is a very small map screen, and there really isn’t much of a reason to stick around, but if you do, you get to listen to this song evolve and it’s just awesome. Just really, really nice. Then there’s a song that appears later in the game called Cherry Blossom Color Season. It immediately kicks off with these gorgeous, sweeping strings and for the first few seconds you feel like you know where the song is going to go, but then this incredibly abrasive Japanese children's choir comes in with this “lalalalala” part and the whole thing takes a weird left turn. I’ll never forget the first time I heard this song and how I foolishly dismissed it straight away. I managed to get the soundtrack before I had finished the game, and when this song came up, as soon as that choir came is I was out. Hard out. I listened to the entire soundtrack over and over, but I always skipped that track because that children’s choir was such a turn off for me. Then a while later I made it to the level in the game where that song plays and I was finally forced to listen to the whole song. I mostly tuned it out and concentrated on the level itself, but toward the end of the song, and I’m not exaggerating here, one of the most jaw-droppingly beautiful string movements I’ve ever heard in my life kicks in and the whole song just makes sense. It’s insanity, because it’s Katamari, but like Katamari, there’s beauty in that craziness. I know I sound like a crackpot, but really, this game deserves every ounce of praise it gets, and it being remade on Switch and PC is such a wonderful thing I can barely contain my joy. All this weirdness might seem like the kind of thing that would put some people off. And honestly, you’re not wrong. But the fact that it’s an accessible kind of weird, and it wears this weirdness right on its sleeve helps. But more than anything, it’s just plain fun. It’s fun to play, it’s fun to watch, and it’s the perfect kind of game for a social game console like the Switch. So anyway, here we are, the week of Smash Bros.’s release. Hype levels are through the roof, and preorder numbers are insane. Smash is going to be a, well, Smash. So in the face of this, it would be crazy to release a new game the same week, right? Sometimes that can’t be avoided, like in the case of Monster Boy and the Cursed Kingdom. Game needed to be delayed, but still release before the holidays. These things happen. Sega Genesis Collection comes out on Switch the same day as Smash, but that’s an evergreen title. It’ll do as well a month from now as it will a week from now. But the people at Namco Bandai have decided that December 7th, the release date for Super Smash Bros. Ultimate, is also the day they’ll be releasing this Katamari remake, and they are effectively sending it out to die. Really, this game is going to get absolutely buried under Smash Bros. and it’s one of the biggest shames of the year. But wait, there’s more! In Japan, they released a demo for this game already. They're putting some effort into at least raising awareness. It’s still absurd because at least from my perspective, most people who would be interested in picking Katamari up but also have the choice of buying Smash are likely going to be buying Smash instead, but at least there’s an effort being made to let people know it’s out there. Here in America though, we didn’t get a demo. Apparently we are going to be getting one, but not until the game’s release date. You know, the day when everyone is going to be playing Smash Bros. It’s also a Switch exclusive, which as a Nintendo fanatic I think is cool, but I also find intensely bizarre. The original Katamari Damacy is a PS2 exclusive, and hasn’t been ported to anything since. Now we get a remake and it’s only on one platform? Granted, it’s probably the best platform to put it on, but it’s hard to fathom the game not doing at least kind of well on PS4 and Xbox One. Then there’s the physical problem. The physical version of Katamari appears to be a GameStop exclusive. Which… what? Seriously? We’re limiting this to a single retailer? Why would an offer like that even be on the table? How is it that this game has been put into such a giant stack of unfortunate circumstances? And you just know Bandai Namco is going to look at the sales and say “Well, it didn’t sell.” and either claim that the Katamari brand is dead, or their games don’t sell on Nintendo platforms. And you know what’s even more bizarre about that? Smash Bros. is being developed by Bandai Freaking Namco!!! Why on Earth would they do this to themselves? So yes. Katamari has some strikes against it. And yes, Smash Bros is coming out on Friday. But in all seriousness, do not sleep on this game. 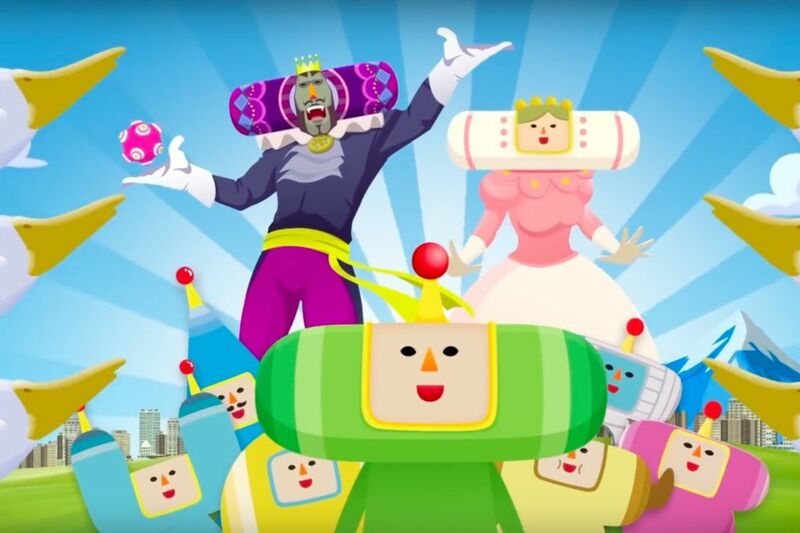 Whether you’ve played the original or not, the first Katamari Damacy game is one of the most pure gaming experiences you’re likely to have in your life and is absolutely not to be missed. Sure, there have been a bunch of sequels out there on different platforms over the years, but none of them holds a candle to the original. It was lightning in a bottle, and nothing has been able to live up to it since. I hope with all my heart that Katamari Damacy REROLL finds the audience it deserves. If you’re still reading this, go give it a try. Download the demo off the Japanese eShop. I promise you won’t be disappointed.